Many apartment buildings built between 1920 and 1970 with an open storefront or a tucked-under garage may be classified as soft-story buildings. 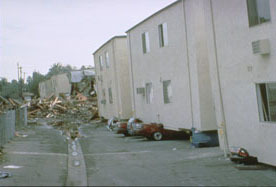 These buildings, also known as "Soft, Weak, or Open-Front (SWOF) Story” buildings, have difficulty maintaining structural integrity during an earthquake. Soft-story buildings have been responsible for a significant portion of damage during past earthquakes. For example, during the 1989 Loma Prieta earthquake, soft-story collapses killed 63 people and left 7700 housing units uninhabitable. And in the 1994 Northridge earthquake, soft-story collapses killed 16 people and left 34,000 housing units uninhabitable. 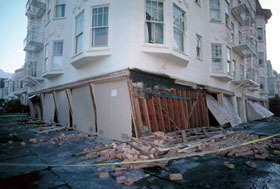 Because the United States Geological Survey has determined a 62% probability that an earthquake of 6.7 magnitude or greater (similar to the Loma Prieta earthquake), will occur in the San Francisco Bay Area within the next thirty years, Bay Area residents should reinforce soft-story buildings to minimize casualties and property damage. The need to retrofit of soft story buildings in the East Bay has the greatest urgency because of the proximity of the Hayward fault as revealed in this PBS Video on seismic retrofitting. San Francisco. The City of San Francisco has compiled an inventory of more than 6200 buildings that require further screening by engineer professions.. For more information, please see our Soft-Story San Francisco page. Alameda. The City of Alameda has prepared a soft-story ordinance similar to that of the City of Berkeley, which aims to identify soft-story buildings and requires their owners to submit an engineering analysis report. More information regarding the City of Alameda soft-story ordinance is available on our Soft-Story Alameda page. Berkeley. The City of Berkeley passed its soft-story ordinance in 2005 and began notifying building owners of ordinance requirements soon after. Owners must submit an engineering report, but are not required to complete a retrofit. The ordinance, however, gives incentives for owners to complete a retrofit voluntarily. More information regarding the City of Berkeley soft-story ordinance is available on our Soft-Story Berkeley page. While only these cities presently have soft-story initiatives, more cities around the Bay Area may begin to implement ordinances to address the soft-story problem. More information about your city’s plans should be available at its planning or building department. Enginious Structures, Inc. has been working extensively with the Bay Area municipalities to ensure compliance with Soft-Story Ordinances. We can ensure that your building is in compliance with the soft-story ordinance. Out of the dozens of seismic reports Enginious Structures has prepared, all of them have been approved and many retrofits have successfully been completed to the full satisfaction of the building owners and municipalities. For examples of our soft-story projects, please visit our Soft-Story Project Gallery. By choosing Enginious Structures to complete your seismic engineering report, you can ensure that it will be cost-effective, innovative, practical and sustainable. For more information about preparing a soft-story report, please email us at info@enginious-structures.com or call our office at (510) 272-9999 to speak with a structural engineer experienced in seismic analysis and retrofit design. Enginious Structures © 2005-2012. All rights reserved.